Sketch #6 from 1964's Stuttering Parrot with notes penned in the margins by editor Walter Retan. The notes in the bottom left corner indicate Retan's dissatisfaction with this particular sketch. There is a lot wrong with it including Skinny not being skinny enough! See how Mr. Kane cleverly fixed the problems by clicking on the link to the left! Hitchcock Presents" and notes the page of the manuscript where this scene takes place. 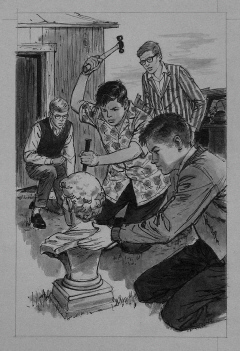 The collection of Harry Kane Three Investigators illustration art that surfaced in 2003 in New York City was perhaps one of the most unique finds in recent series book history. Never before has such a large amount of vintage juvenile series book artwork appeared in one place at one time for sale. But the scope of the collection was the truly amazing thing, it boasted not only the finished artwork used in the books but contained concept paintings, preliminary sketches and printer's proofs as well. With all of this material, one can literally watch the development of certain titles and certain aspects of the series occur right before one's eyes. It is conservatively estimated that Harry Kane produced 250 individual pieces of Three Investigators artwork during his time with the series and less than half of that is known to have survived. 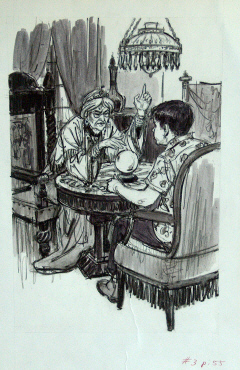 Below is a brief inventory of The Three Investigators artwork that was in the New York collection in October, 2003. The original 1967 cover art for #7 TheMystery of the Fiery Eye. Finally, there were roughly ten printer's proofs of the covers for the following titles: #'s 3, 4, 7, 9, 10 and 11. A few of these had been mounted on paper and signed by Kane. There were three printer's proofs of the blue graveyard endpapers. Mr. Kane had also cut the seven printed illustrations from a copy of Terror Castle and mounted them on paper - presumably he never received the originals back from Random House. Not including the printed items, there were a total of 104 original Harry Kane Three Investigators pieces in this trove, or roughly two-fifths of his total output for the series. Don't let the number mislead, this collection was a real find by any measure! So where are all of the items that are missing? Either Mr. Kane never got them back from Random House or he sold them at some point in the past. Some of Harry Kane's best illustrations are found in the earliest titles and almost all of those pieces were not in this collection. From The Three Investigators artwork one finds that Harry Kane was given an early manuscript of each book to read and he would pick out seven scenes of his choosing to illustrate. 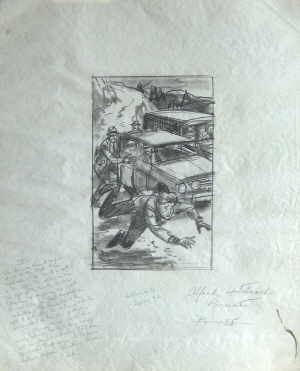 His first job was to create a preliminary sketch of each scene on a 10" by 14" piece of vellum. These sketches would be given to the editor (Walter Retan for books #1 - #10 and #12; and Eugenia Fanelli for books #11 and #13 - #16) of the series. The editors would write notes or draw diagrams in the margins of the sketch suggesting any changes that might need to be made for the final illustration. There are occasions where the idea in a preliminary sketch was not used at all because the passage for a particular scene was either deleted from the manuscript, re-written or the editor just wanted to see something else drawn instead. The preliminary sketches are some of the most unique and interesting artifacts that a student or historian of this series could ever hope to find. Both individually and as a group they offer a wealth of information on the development of individual titles as well as previously unknown background information on the series. The only dated piece of Kane artwork is an alternate preliminary sketch from Laughing Shadow which bears the date "3/5/69." I was amazed at the great care the editors took to make sure that the illustrations were accurate and correct for each scene. A good example is the preliminary sketch pictured to the right. These people obviously cared about the quality of this series and it shows in the final product. As one reads the comments that were hand-written on each of the preliminary sketches, a little of the personalities of the editors themselves begins to emerge. Walter Retan's comments almost seem harshly critical at times but he knows what he wants to see on paper. Eugenia Fanelli's comments are likewise constructive but she also finds many opportunities to give positive feedback as well. Please click on the following link to see a side-by-side comparison of Harry Kane's seven original preliminary sketches with the final published illustrations from 1964's The Mystery of the Stuttering Parrot. The finished, or final, illustrations are the ones that were actually published in the books. Once Harry Kane received the "O.K. to go to finish" on his preliminary sketches he would craft the final product on standard illustration board measuring 15" x 20" with the drawings themselves measuring 8 1/2" x 13" . The finished illustrations are highly polished pieces of art compared to the preliminary sketches and often the reproduced pictures one sees in the books don't do the original pieces justice. On most of the finished Three Investigators illustrations there are very few notations in the margins. Mr. Kane almost always scrawled the title of the book in the lower right corner of the board and cropping lines are always visible along with some of the technical information such as the illustration number, page number and sizing information. Editor notations on finished illustrations are rare but sometimes very minor touch-ups or corrections to the image were made and noted. Mr. Kane often peeled the finished illustration from its backing board, presumably to save on storage space once the drawing was returned to him. So, most of the final illustrations appear to be drawn on very thick paper instead of illustration board. Finished Illustration #3 from The Mystery of the Talking Skull, 1969. 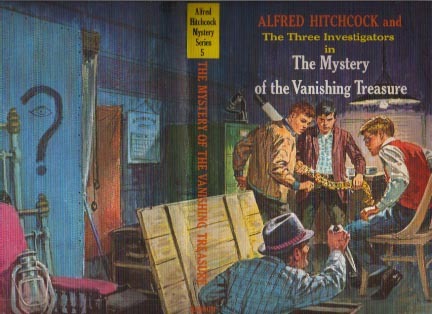 Harry Kane created fourteen pieces of cover art for The Three Investigators series and seven of them were in the New York collection. Painted in brilliant gouache on art board measuring approximately 28" x 22", the images are each roughly 22" x 16" in size. The four best preserved paintings had a sheet of loose cellophane over the painting held down by a loose matte all of which was covered with the art board's top sheet. Harry Kane's signature and the title of the painting appear on the top sheets of two of the paintings. The mattes and/or the art boards contain cropping marks and some technical information for the photographer and the production department. On the matte for Coughing Dragon Mr. Kane's sense of humor shines, he wrote: "PLEASE Be Careful Of This Art!" Notations made on the cover art for Screaming Clock indicate that the artwork was turned in at the last minute and a "rush job" was needed by the production team - click HERE to discover why! 1. An alternate, or concept, painting in red for the graveyard endpapers. 2. A "photostat" of what eventually evolved into the blue graveyard endpapers. Both of the above items can be studied by clicking HERE. 3. 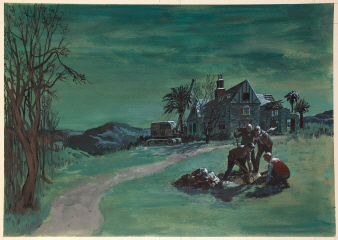 A small color painting of what may have been a concept painting for the cover of Flaming Footprints. The idea was later used to create one of the black and white internal illustrations for the story instead. A proof of the cover art for a book would be submitted by the printer to the Random House Production and Art Departments for approval of printing quality, color, size, etc. The artist would receive one or more of these proofs as well. These were printed on the same material used for the books and generally trimmed to the same dimensions of the books. While these are not to be considered as original art, their rich, vibrant, accurate colors make them the next best thing to owning the original cover art. Some Three Investigators printer's proofs list titles on the back cover, some don't. Based on the sparse clues found on Harry Kane's original artwork, it seems likely that the authors probably had their first drafts of the stories turned in by the end of January. The artist received copies of the manuscripts and he would turn in his completed preliminary sketches by the end of February or early March. The manuscripts were often re-written and revised during this time. Many of Harry Kane's preliminary sketches contain notes from the editors stating that certain scenes had been deleted or revised thus necessitating new sketches. For example, the preliminary sketches indicate that #12 Laughing Shadow originally had several scenes featuring Skinny Norris but his role in the book was later greatly diminished. And there are three prelims from #16 Nervous Lion that had the word "Delete" or "Deleted" penned on them. The preliminary sketches suggest, and in some cases outrightly state, that the manuscripts for books #12, 15 and 16 all went through major revisions. Finished, or final, illustrations may have been completed by the end of May. 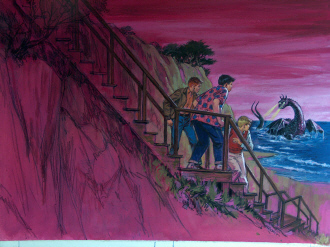 Notes on some of the cover art suggest that Kane developed the cover paintings in the same time frame that he worked on the internal illustrations. The artist's role in the whole process would be finished by June if not earlier. We know that new titles in this series were worked on and issued in pairs once each year during the time that Harry Kane was the artist. The new titles usually hit the shelves in September or October for the Fall school semester and in time for Christmas sales. If anyone reading these pages on Harry Kane and his art knew the man personally, I would very much enjoy hearing from you and perhaps adding more to these pages. The same is true for anyone who worked for Random House who could offer additional insight into the production or distribution end of the business. Finally, my sincere thanks to Mr. Kane's daughters, Hadiya and Janice, who shared biographical information along with personal memories and photos of their father, and to the owners of the New York collection who allowed me to visit, rummage through, and purchase some of the Kane artwork on two separate occasions. All artwork presented on this page is from the collection of Seth T. Smolinske unless otherwise noted. Original Coughing Dragon cover art and Kane signature, 1970. Formerly in the Smolinske collection, now in a private collection. Finished Illustration #6 from The Mystery of the Fiery Eye, 1967.